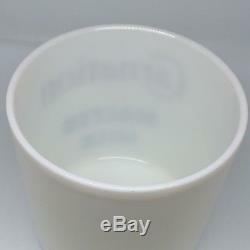 Lass canister with aluminum lid. Silk screened logo: Dark Red and Dark Green. Height: 6 inches, 15.4 CM. 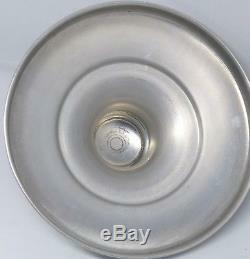 Diameter top of jar: 6.25 inches, 16 CM. Thank you for shopping in Whoo Hoo Depot. 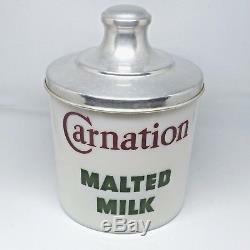 The item "Vintage 1940-50's Soda Fountain Carnation Malted Milk Milk Glass Canister w Lid" is in sale since Tuesday, May 1, 2018. 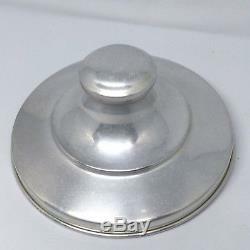 This item is in the category "Collectibles\Advertising\Food & Beverage\Dairy\Bottles & Containers". The seller is "whoohoodepot" and is located in Long Beach, California. This item can be shipped to United States, Canada, United Kingdom, Denmark, Romania, Slovakia, Bulgaria, Czech republic, Finland, Hungary, Latvia, Lithuania, Malta, Estonia, Australia, Greece, Portugal, Cyprus, Slovenia, Japan, China, Sweden, South Korea, Indonesia, Taiwan, Thailand, Belgium, France, Hong Kong, Ireland, Netherlands, Poland, Spain, Italy, Germany, Austria, Israel, Mexico, New Zealand, Philippines, Singapore, Switzerland, Norway, Saudi arabia, Ukraine, United arab emirates, Qatar, Kuwait, Bahrain, Croatia, Malaysia, Chile, Colombia, Costa rica, Dominican republic, Panama, Trinidad and tobago, Guatemala, El salvador, Honduras, Jamaica.